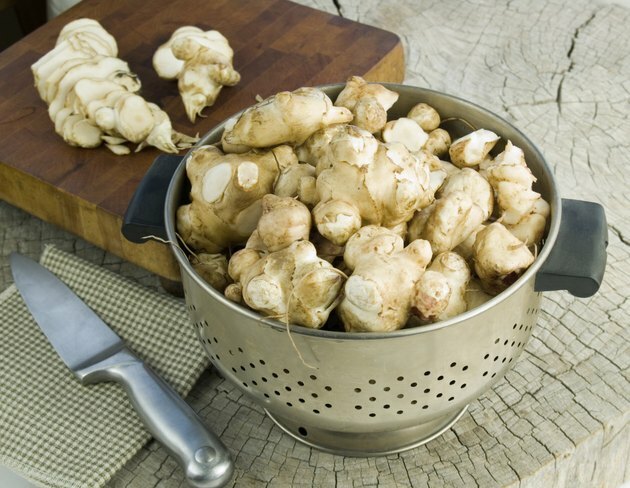 Jerusalem artichokes, also called sunchokes, aren't like regular artichokes. 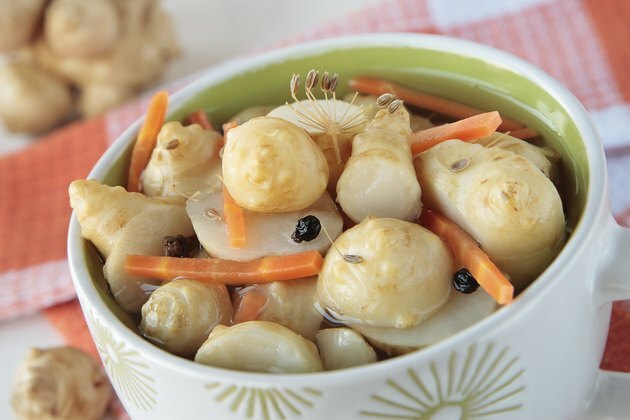 These root vegetables have a taste that's similar to water chestnuts, and you can eat them raw or cooked. 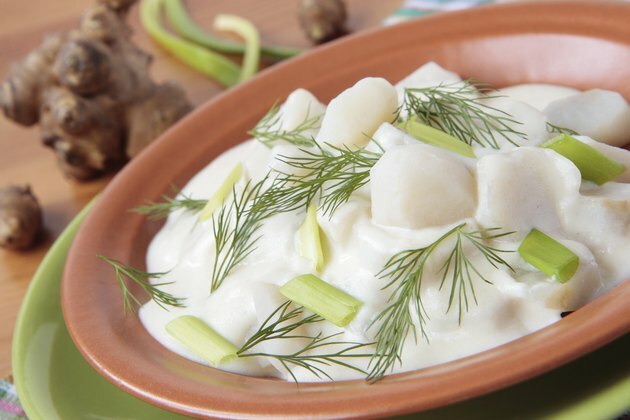 If you eat them cooked, they have a creamy texture and you can use them in ways similar to potatoes. Jerusalem artichokes provide a number of vitamins and minerals and may provide some health benefits because of their role as a prebiotic. 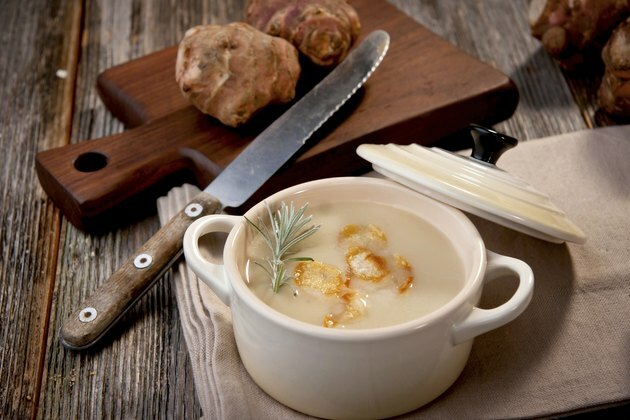 A 1-cup serving of sliced, raw Jerusalem artichokes contains 110 calories, 3 grams of protein and 26.2 grams of carbohydrates, including 2.4 grams of fiber, or 25 percent of the daily value. Fiber may help lower your risk for high cholesterol, constipation, heart disease and certain types of cancer, according to the University of Arizona Extension. It may also make it easier to control your blood sugar levels and maintain a healthy weight. Each serving of Jerusalem artichokes has 10 percent of the daily value for vitamin C and niacin, and 30 percent of the DV for thiamine. Vitamin C acts as an antioxidant and limits the damage to cells that free radicals cause; higher intakes of vitamin C may help lower your heart disease and stroke risk, according to the Linus Pauling Institute. Niacin and thiamine are B vitamins that help keep your hair, skin and eyes healthy, and that turn the food you eat into energy for your body. Eating a cup of sliced sunchokes provides you with 11 percent of the DV for copper, 12 percent of the DV for phosphorus, 18 percent of the DV for potassium and 28 percent of the DV for iron. You need copper and iron for forming red blood cells that carry oxygen in your body to where it's needed, and potassium plays a role in forming proteins. Phosphorus helps form strong bones and DNA. 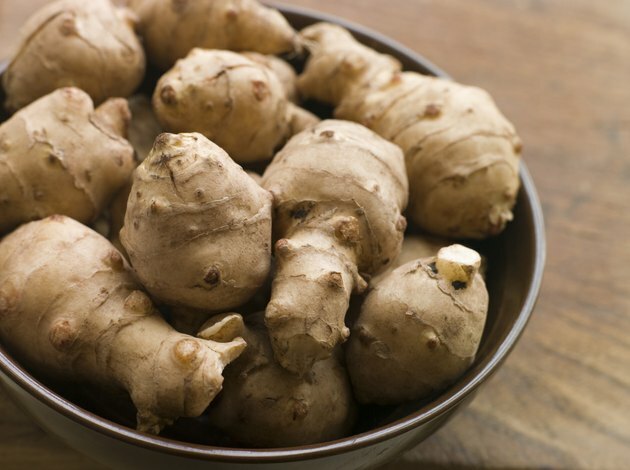 Most of the carbohydrates in sunchokes are in the form of inulin. Inulin acts as a prebiotic, providing a source of food for beneficial probiotic organisms in your body. Probiotics may help improve your immune function, produce vitamins, lower your cholesterol and prevent disease-causing bacteria from multiplying. Consuming prebiotics may be an easier way to increase the probiotic organisms in your body than taking probiotic supplements, because you don't have to worry about them surviving the digestive process like you would with probiotics. A study published in the "British Journal of Nutrition" in 2010 found that drinking fruit and vegetable juice shots that contained inulin from sunchokes increased the amount of certain types of probiotic bacteria in the body.